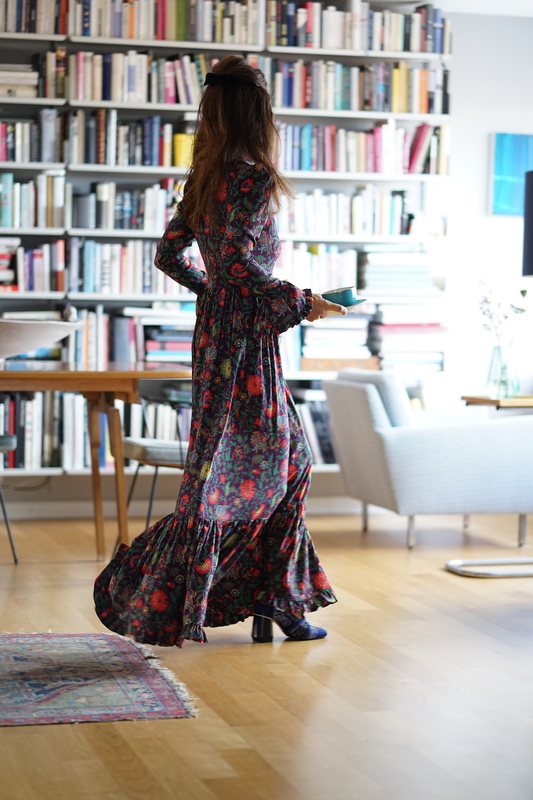 Putting on a floral print dress by the Designer JJ Martin is a true statement, one could say a way of life. 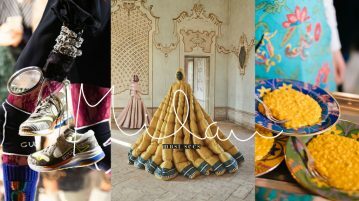 The former US Wallpaper magazine journalist who has been living in Milan for many years, always had a flamboyant style of editing fashion and design, with an especially grand love for vintage and a special eye for everything cheer-and colorful in fashion. She created her brand by originally selling her own vintage jewelry and cloth collections on her husband’s website and quickly developed her very own signature style. The site had such a fresh and unusual way for selling fashion at the time that it really enthralled many fashion affine women, making them not only aware, but also obsessed by the exclusive brand. She now sells her collection worldwide, as well as a home and tableware collection. As we love to wear her dresses all year round, we decided to ask her about some styling tips for winter. 1. For many women, prints are just a summer thing. But I wear prints all year round. I think it’s pretty amazing to have bold pattern in the colder months especially on an outerwear piece. JJ Martin lounging in her Milanese apartment. 2. If you’re going to wear a patterned floral coat, like our brocade bouncy coat for example, the trick is to keep everything else rather toned down. I may layer a patterned silk blouse underneath in similar colortones, but the pantsarealmost always a solid color and I love to wear a camel mohair sweater underneath. This coat is also great for evening. The rich jacquard looks wonderfulover a light chiffon or crepe de chine long dress. If in doubt, wear a dress by La Double J when going out. 3. 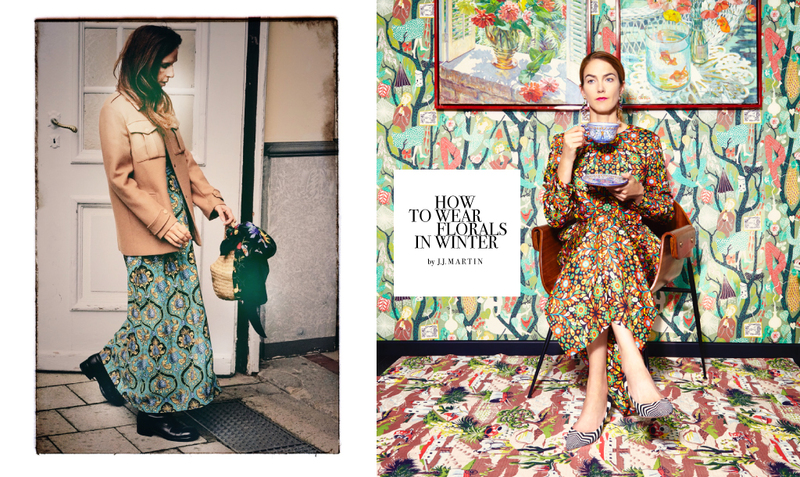 A short floral printed dress,like our peasant dress;looks great in winterwith opaque tights, flat military boots and an oversized sweater. Let cold weather not put you down for wearing colourful prints, mix and match with a box jacket, in this case by sportmax, shoes by Dolce e Gabbana, vintage, raffia bag found and vintage silk scarf by Gucci. 4. Just yesterday in late January I was wearing wide leg printed silk pants. These are the perfect all year-round pants. In the winter they look great with snug turtlenecks in strongsolid colors or even an oversized cardigan. 5. Some days I just want a small flash of print. In that case, I’ll wear a printed silk blouse, and have it pop up of the collar of a sweater. The rest of the outfit might be all neutral colors, sometimes even all black! 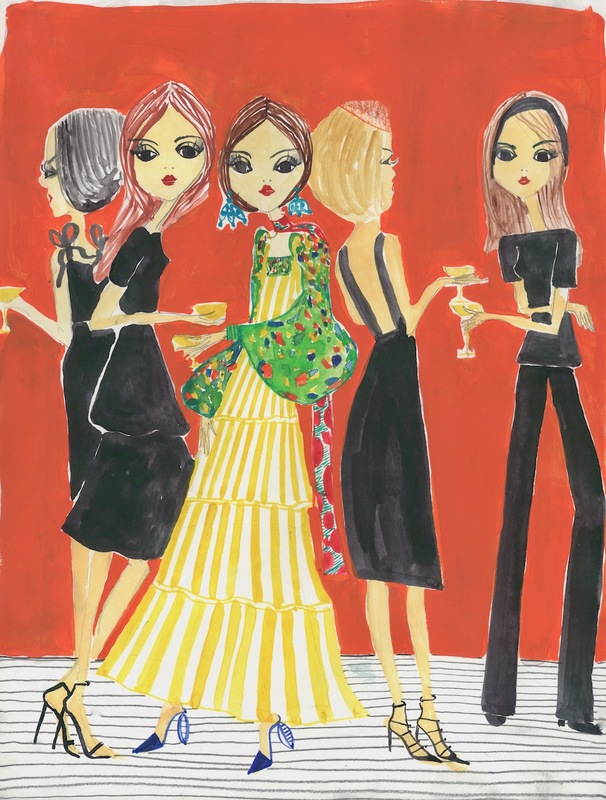 Always the talk of an evening when wearing mixed prints, illustration art by Irmasworld. 6. It’s amazing to wear print to winter cocktail parties; everyone always stops and asks what you’re wearing because everyone else is in a sea of dark colors. I love to wear our floral-patterned Oscar skirt in a poufy radzmir fabric with our matching happy wrist blouse in printed silk twill. It issuper feminine,but not too over the top. 7. If you want to mix floral prints with other prints, geometric prints are thebestway to go. Personally,I love stripes with florals, which is veryeasy to do with a striped sweater or pants. I also love smaller geometrics, like cubes or checks because it tones down the movement of the blooms, adding diversity and interest. Next Article Here are 6 recommendations and ideal products for achieving a facial glow post January!